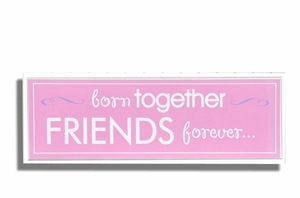 Born Together Friends Forever Twin or Triplet Girls Plaque 5" x 17"
Twin or triplet sisters will be best friends forever! Decorate the girls� room by hanging this unique 5"x17" wall plaque. Makes a unique and fun baby shower gift for girl twins or triplets!